The school colors are purple and gold, so I created 3 cards and she can pick whichever one she wants to use. The colors I decided to use were Elegant Eggplant and Crushed Curry. 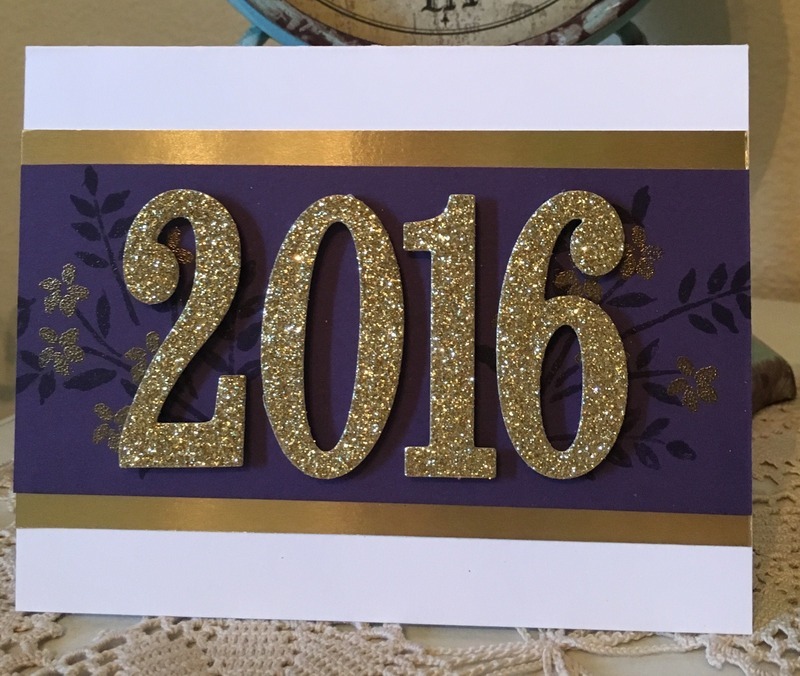 In some instances I opted for actual gold foil paper, or glitter paper. 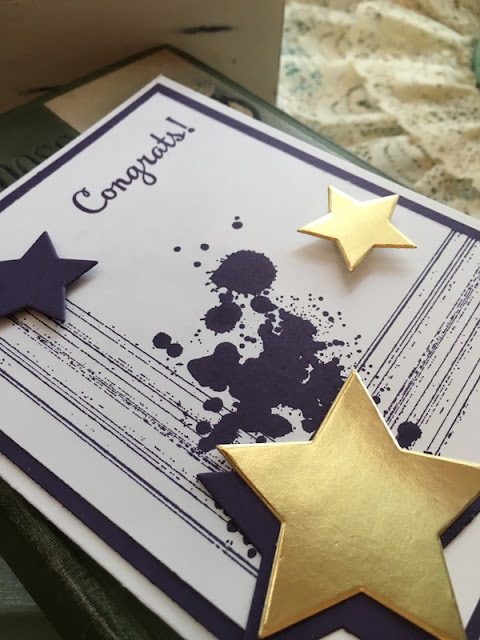 I also used some gold heat embossing on some of the cards. After I created this card, I decided it would probably be a good idea to try some other card ideas that go in totally different directions of style. When I made this card, I was thinking of a more traditional graduation card with bold numbers. Of course following the theme of gold, I opted to cut them from Glitter Paper using the Large Number Framelits, and a little feminine touch by using stamps from Number of Years stamp set that goes along with the framelits. 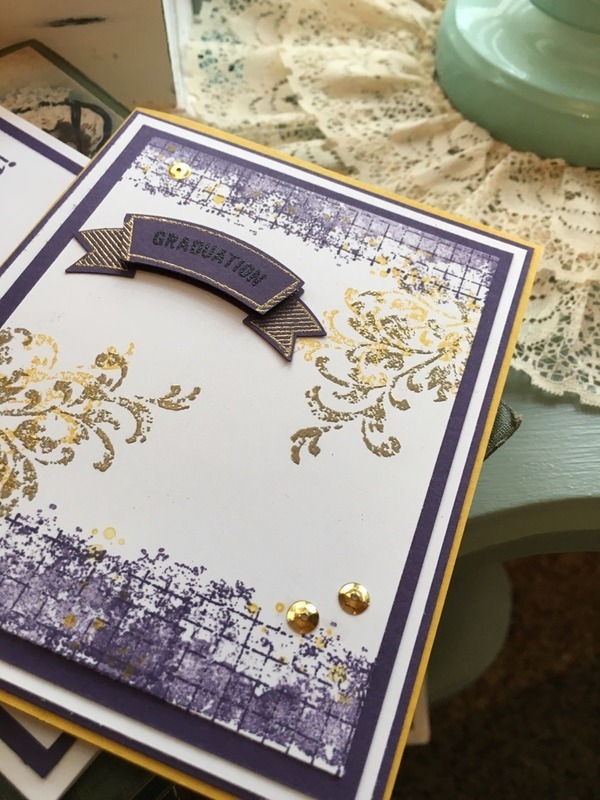 I thought the flower bunches stamped in Elegant Eggplant over the coordinating paper would make it subtle, and the flowers embossed in gold would help it retain some elegance. With this last card, I decided to go more contemporary with bold lines and splashes of color. 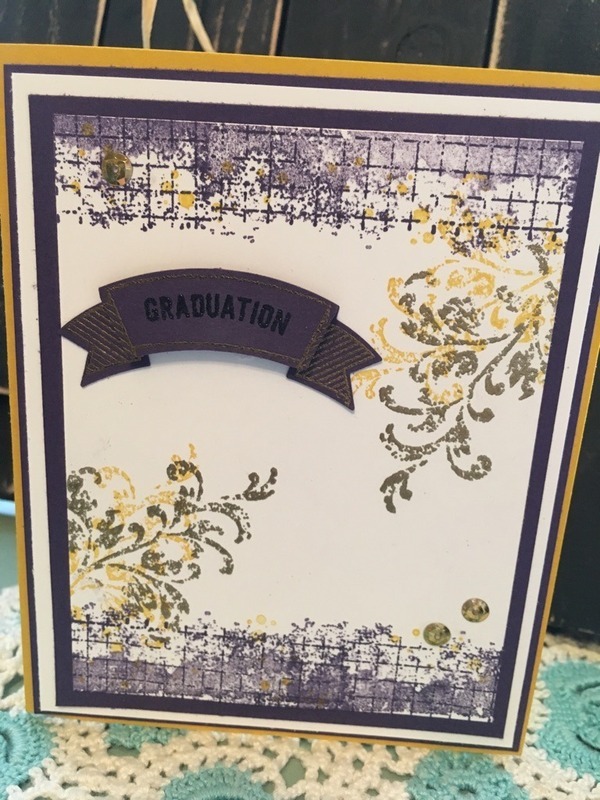 The stamping was done with the Gorgeous Grunge stamp set and the sentiment was stamped with a stamp from Happy Happenings. The stars were cut with the Stars thinlit dies. So, I would love opinions. Which card would you choose? And by the way....she couldn't choose; she wanted all 3 of them! Don't forget, every comment you leave on any post from 5/14/2016 through 5/25/2016 will enter you into the drawing for a brand new set of the new Stampin' Write Markers that feature the new in-colors for 2016-2018. Great set of cards! My favorite is the one with the big gold sparkly numbers! I love the glitter paper and the contrast with the Elegant Eggplant cardstock! Oh WOW, What an Amazing Job you did on all three cards. I don't blame her for wanting all three. I think my favorites are the first and second one. 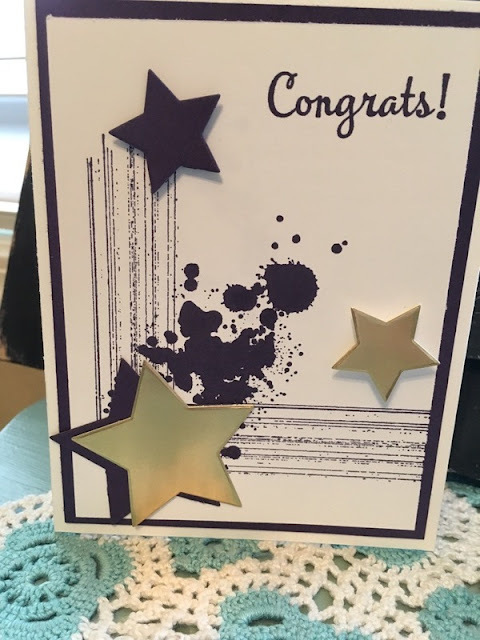 I just made a graduation card to in purple and yellow. 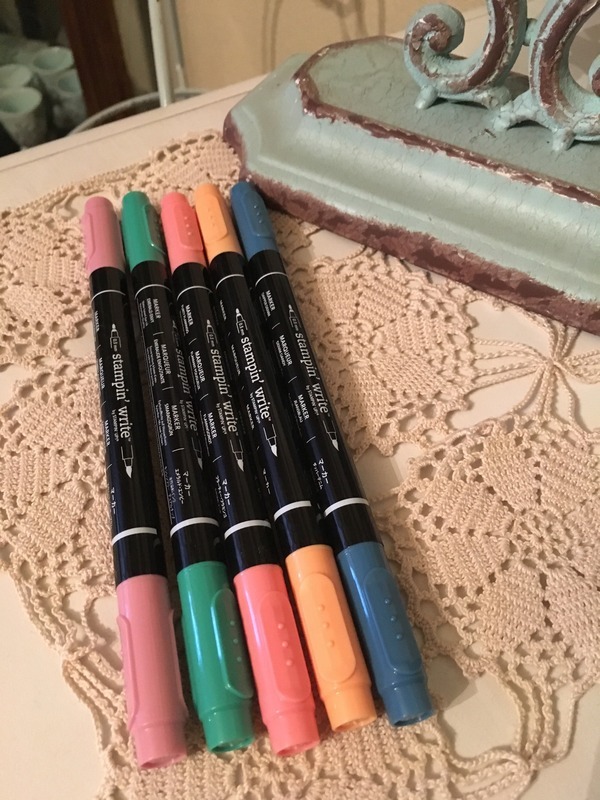 Love those colors together. Glad I stopped by. I think I would choose the third one!